Arrive at Juan Santamaria International Airport (SJO) before 1:00 pm. Your Trip Leader will pick you up from the airport and we’ll head to the rainforest! (~3.5 hour drive). If you are prone to motion sickness we suggest taking any medication before the drive. It’s a beautiful and winding drive through the mountains of Costa Rica. Stop for souvenirs and snacks in Los Angeles Cloud Forest as you marble at all the green and lush mountains around you. Enjoy your first amazing breakfast at the eco-lodge, fresh coffee, organic vegetables and homemade breads await for you. After breakfast you can hike around the Ranch or fly through the tree tops at one of the World’s best zip-ining tours in Costa Rica (zip-lining is optional and not included). After a nice morning walking around the property, enjoy a tasty lunch at the eco-lodge made with the vegetables produced at the farm. Explore the grounds on a tour of the eco-lodge, learn all about the organic farm and the use of sustainable sources of energy and good ecological practices while taking in the great views of the surrounding mountains. Enjoy another wonderful dinner at the eco-lodge while listening to the sounds of nature at night. Take the evening to get to know your new friends while enjoying a nice tropical drink under the stars. Start the day with new energy provided by the lush forests of Costa Rica and enjoy another tasty breakfast at the eco-lodge. Depart to La Fortuna to enjoy more outdoor activities. "La Fortuna" is Spanish for "The Fortune" and was named for the towns fertile lands. Explore Arenal Lake on a pedal board and visit the local waterfall in the middle of the rainforest, a local spot where you can freshen up into a natural pool. Get a local and delicious lunch called a “casado” while you are exploring La Fortuna and freshen up with a delicious fruit ice cream. Spend your last afternoon soaking up at the hot springs, warmed naturally at Termalitas del Volcan and let your muscles relax after a few days filled with incredible adventures (optional activity). After a full day of activities, enjoy another wonderful dinner at the eco-lodge and get ready for another day of adventures out in the wild. Enjoy the hammock in your bungalow and rest while taking in the surrounding landscape. Enjoy a delightful breakfast at the eco-lodge, get the feel for the true Costa Rican morning flavors with a nice coffee and a plate of tropical fruits. Spend the morning hiking various trails on the property or choose from the following optional adventures: white water rafting, kayaking in the Arenal Volcano Lake or enjoy a relaxing yet adventurous horseback riding tour around the lush farmlands. After lunch, opt for a hike to the Arenal Observatory in search for monkeys, toucans and other wild animals (optional activity) or relax at the hotel. Tonight you’ll enjoy the closing dinner at the eco-lodge with your new friends where you will all share your best moments of the adventure you just had. Optional night out in La Fortuna to finish your amazing trip with a high note, full of latin music and cocktails (transportation not included). One more amazing breakfast at the eco-lodge before you head towards Costa Rica's world famous beaches. Pick up several new friends who'll be joining us at the beach and tour the little town of Alajuela. Make a quick stop at Rio Tarcoles where you can see groups of Costa Rican Crocodiles. These crocs can reach lengths of up to 12 feet! Arrive at Playa Hermosa. A beautiful black sand beach recognized as having one of the most consistent surf breaks in the world. Soak in your first sunset in Costa Rica. Remember to bring your bathing suit! Enjoy your first dinner (and drinks?) right by one of the coolest black sand beaches in the country. Depart for our boutique hotel in Manuel Antonio (~1 hour drive). After getting settled in, it's up to you whether you want to relax or hit the town. Enjoy an authentic Costa Rican breakfast right at your hotel. Depending on the tide and the weather your Trip Leader will take you to our favorite secret beach in the area. Spend the morning lounging under the Costa Rican sun away from tourists. Head to the beach for an optional surf lesson. Learn how to surf from some of Costa Rica’s best surf instructors on one of Costa Rica's best beaches (depending on the tide). Enjoy a Costa Rican dinner at our boutique hotel. Have a delicious Costa Rican breakfast. For those craving an even further off-the-beaten-path activity, you can spend your day hiking to epic hidden waterfalls in Quepos. Even the drive will be an adventure as we traverse through little known dirt roads. Take the local bus to the local farmers market in Quepos to sample tropical fruits, cheeses, and much more. Relax on El Malecon with a perfect view of the sun setting over the ocean. Enjoy dinner in town and have an optional night out on the town with your new friends. Immerse yourself in the local community of El Cocal by learning how to cook a delicious Costa Rican meal. Learn about Costa Rican culture and traditions from local friends. Have lunch in El Cocal with your new friends. Enjoy local music and dancing with the community. Relax at the local beach with your group and soak in the tropical views of Costa Rica. Enjoy the last dinner out at Manuel Antonio. Optional night out or star gazing. Enjoy one final breakfast in paradise with your group of friends before departing to the airport to catch your flight back home. Be sure your flight departs after 1:30 pm. Transportation is provided back to Juan Santamaria International Airport (SJO). We look forward to welcoming you into our close-knit travel community. 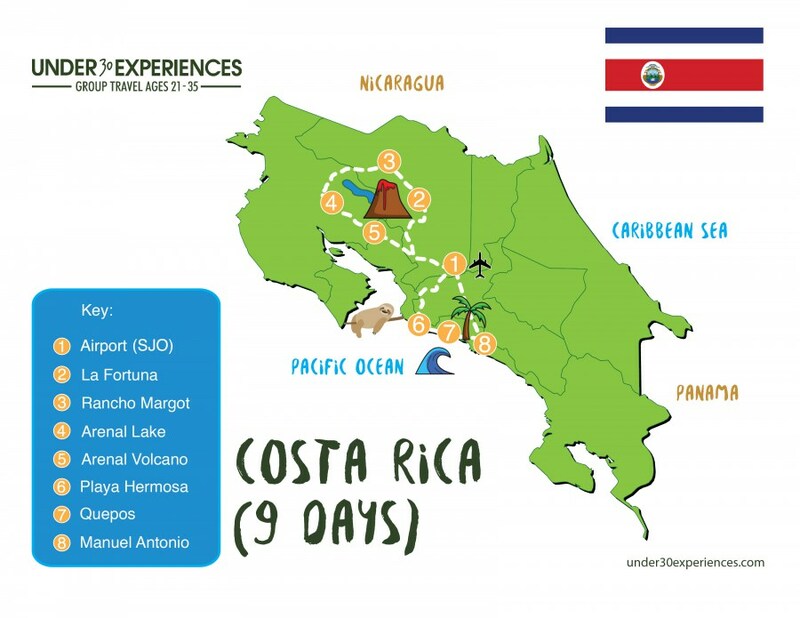 The September 11, 2019 itinerary visits the beach first and then rainforest. The order of the days is reversed.